This website is brought to you by Seomra Ranga.com. It can be used as a history resource when teaching about Penal Times in Ireland, or it can be used when dealing with the history of the faith in Ireland. It could also be used as the basis for the study of your own local holy well. Classroom resources can be downloaded from the "Resources" section. I hope this web site will prove to be a valuable resource for teachers. Holy wells are places of popular religious devotion where people come to pray and leave simple offerings. Holy wells invariably tend to date from pre-Christian times, during which they served as a form of natural religion in which the well was held to be sacred. There are hundreds of holy wells all over Ireland, many of them still in use. They vary greatly in appearance, some are very simple, decorated only with rounded river pebbles, others are highly ornate and adorned with holy statues, medals, pictures, rosary beads, flowers and candles. Many of the wells were famous for their power to heal diseases, powers which were usually attributed to the patron saint. Many stories relating to a particular well usually tell that the saint was reputed to have used the water of the well to baptise converts, thereby bestowing a blessing on that well. Days of special devotion were associated with many of the wells. This day was usually on the feast day of the particular saint, a day which commonly became known as the Pattern (or Patron) Day. The water at many of the wells is believed to have curative powers, and a few are said to have power over the weather. Many customs and traditions have been associated with some of the wells. Religious customs and practices are closely linked with most of the wells. In some places, rags, handkerchiefs or clothes are tied to the trees above or around the well. In many instances the piece of cloth was red as it was believed that the colour red would resist the power of evil spirits. The idea about this custom is that as the rag rots away, so too does the illness. At some wells it was customary to bathe a diseased part of the body with a piece of cloth. When this had been completed the piece of cloth was attached to a tree in the vicinity of the well as a votive offering. Stones and trees are also associated with many wells. Such stones and trees are believed to be sacred because of their special association with the well. Holy Wells can be found in all types of areas all over Ireland. They are found near the seashore, on the top of mountains and hills and in bogs. However, the greatest majority of the holy wells are to be found at or near churches and graveyards. In many cases, the church may be no more than the ruins of an ancient building, or the church may even no longer exist. Many holy wells appear to have specialised in the curing of specific diseases - toothache, backache, headache, eye diseases, sick children, mental illness, sprains, wounds, rheumatism, diseases of the stomach and bowel, obstetric and gynaecology illnesses. Such illness are sometime reflected in the names given to the wells: Tobar na Súl (the Eye Well); Tobar na Plaighe (the Well of the Plague); Tobar na nGealt (the Well of the Insane); Wart Well. "As a rule, all the Irish saints have one or more blessed wells dedicated to their memory in the immediate neighbourhood of the churches which they founded. Indeed, the church was never founded except near a well. Pure water was necessary, not only for Baptism and for the Holy Sacrifice, but also for the daily needs of the holy men and women whose lives were given there to the service of God. What wonder these became holy wells - blessed for Baptism, used at mass, giving daily drink to generations of saints, who, with pure and grateful hearts, blessed God who gave them those crystal springs. We believe that some of their (ie the saints) ancient holiness still lingers round our blessed wells, that their holy patron's still pray in a special for those who frequent them in a pious and confiding spirit, and that God often hears those fervent prayers and grants special requests to the faithful suppliants through the fervour of their faith and the merits of the saints.". - Extract from "Holy Wells of Ireland"
It is not known with certainty when pilgrimages to the Holy Wells of Ireland began. 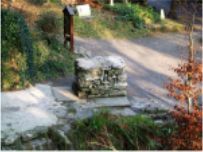 Some historians hold that the springs from which St. Patrick and the early saints of Ireland took water to baptise their converts were held in veneration by the early Christians, and were regarded even in those early times as places of pilgrimage. However, it was only when the persecution of Catholics began after the Reformation that large numbers began to assemble for devotional purposes at such wells. When Catholics were forbidden under the Penal Laws to assemble for mass in churches, altars were erected beside these wells and mass was said there in secret whenever possible for the assembled faithful. If no priest could be found, private devotions were carried out by a lay leader of the people. All Holy Wells in Ireland bear a striking resemblance to one another. Each well is usually found in a quiet place, sheltered by trees, and covered by a flat stone slab to preserve it from contamination. Round the well a circle is traced and there are "stations" or resting places for prayer and meditation at regular intervals along the outline of the circle. Close to the well there is a crude altar beside a tree trunk on which a crucifix in wood or stone is hung. On the branches of the trees in the vicinity, small pieces of cloth may be fastened. These are memorials of pilgrims' visits. At the close of the visit, the pilgrim may drink some water from the well out of a vessel secured by a chain to a nearby stone or wall. Patrick Logan, in his book "The Holy Wells of Ireland", cites a claim that there are approximately 3,000 Holy Wells in Ireland. He claims that almost every parish in the country has at least one holy well. Some holy wells may not be well known as they have fallen into disrepair or may not be visited any more. The following is a list of holy wells that can be found in Ireland. This is not an exhaustive list, just a list that has been garnered from books and internet searches. I'm sure there are many more wells throughout the country. Please e-mail me using the link below to include any other wells in your locality that are not on the list. Let me know also if there are any inaccuracies in the list of holy wells. St. Colmcille's Well, Ballycullen Road, Tallaght - The widely known Shrine and Well of St. Columcille at Ballycullen lies off the Old Ballycullen Road within the boundary of St. Annes parish. The shrine was set up through the efforts of Fr. Philip Doyle and Fr. Malachy Hughes both of the Augustinian order. The project came about when Fr. Doyle noticed that the local postman had a habit of disappearing into a field close by whilst on his rounds. Subsequently Fr Doyle learned that there was a well situated in this field which was venerated locally in the name of St. Columcille. It was discovered that the postman Pat Murray, never passed the place without dropping in to say a prayer at the well and to take a drink from its waters, doing what his father and grandfather had done before him, and in doing so following the same custom of the people in the district. According to local history, St Columcille rested here after a long walk from Glasnevin. It was believed that he quenched his thirst from the sparkling spring and left a blessing on it and all who might come to drink from it thereafter. In June 1922 the well and shrine were formally blessed and the shrine became more widely known and the number of pilgrims increased. A tree guarded gateway admits the pilgrim who must then cross the small footbridge spanning the stream curving down past the shrine. Steps mounts to the small plateau and the eye is drawing to the white statue of the saint, bearing the traditional staff and satchel and at his sandaled feet the well glints in the sunlight. Tubberbreeda, Cappaghmore - This is reputed to heal vomiting if the water is taken before daylight and fasting in the name of the Saint. Local tradition holds that in times past a Feis was held at this well every Summer on a particular day. The local people got new clothes for the day. Hurling, racing, song and dance made the day enjoyable and all took a drink from the Well. Ribbons, medals and other holy objects were hung from the trees near the Well. On one occasion a row broke out and blood was spilt. Next morning the Well was dry and a new one burst out of the ground at the other side of the road and this still remains to this day although it is not visited. At the former site is a flag stone with cup markings said to be the prints of the saint's knees when she visited the Well. There is the ruins of an old Church and graveyard, Towerhill, between the two sites and St. Bridget was said to have been visiting here when she rested at the Well. Holy Well, Loughmask Road, Ballinrobe - The reason it's famous is because during Penal Days it was blocked up by the English Soldiers. However, miraculously it sprang up on the other side of the road shortly afterwards.